Compared with the chemical pressure, external mechanical pressure affects the crystal inter- and intramolecular landscape more substantially—a huge lattice strain may induce phase transformations and even chemical reactions. Using diamond anvil cells, it is possible to achieve pressure on the order of tens of gigapascals, high enough to significantly change the Gibbs energy, increasing internal energy. Similarly large energy changes are not possible through temperature alteration in solids. 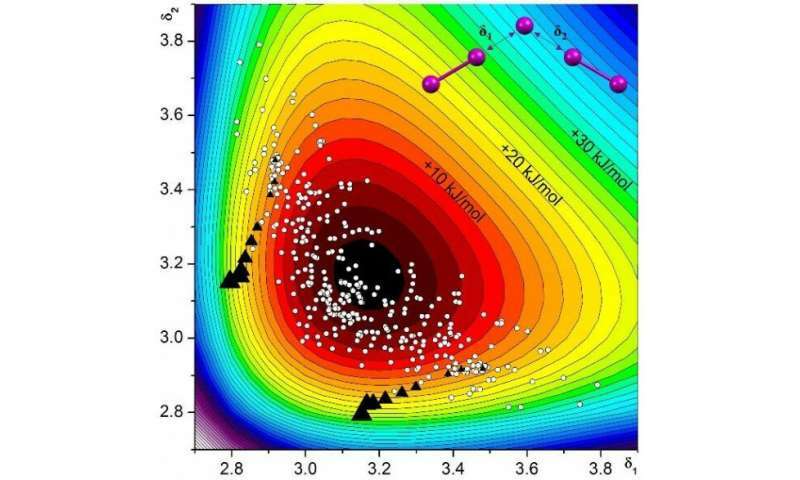 Though complementary, I3 and I2 units are clearly separated and interact mainly electrostatically at ambient pressure .The researchers found that compression stimulates their approach—theoretical calculations show that the covalent contribution increases when the material is compressed. Ultimately, this leads to the formation of CT chains, and drastically increased conductivity. These features make TEAI a tunable, pressure-sensitive electric switch. Structural studies at high pressure can rationalize the synthesis and search for future organic and hybrid semiconductors based on PI. The study results indicate that solid PI may be used as solid electrolytes in dye-sensitized solar cells, eliminating the need for organic-based gelators and ionic liquids in general.